Sometimes you will want to fill in or flood an area with copper(Copper Pour). Before using Copper Area, please make sure your PCB has a closed board outline! Usually this copper area will be connected to a net such as GND or a supply rail. 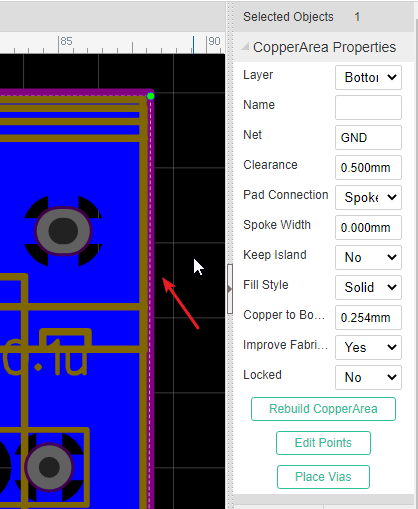 You can draw the outline of a flood using the Copper Area button from the PCB Tools palette. When selecting the copper area outline, you can find its attributes from the right hand Properties panels. Name: set a name for it. Keep Island: Yes/No. This keeps or removes any isolated areas of copper created as part of the flooding process. It is usually good practice to removes these unless you really need them to maintain a more even spread of copper (copper balance) on your PCB. After drawing the copper area, set the net it is to be connected to (floating copper areas are not recommended because they can cause EMC and Signal Integrity (SI) problems). Lastly, don’t forget to click the button Rebuild Copper Area to rebuild the flood. Hotkey E to start draw copper area. Hotkey Shift+B to build all of the copper areas. Hotkey Shift+M to clear all of the copper areas. Hotkey Delete or BackSpace to redo previous steps. 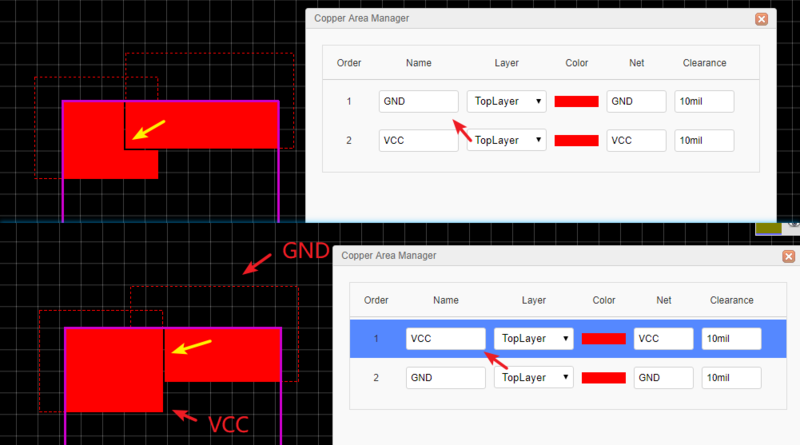 If you after copper pour but no copper show up, you need to set it a net same one of the PCB nets, or keep the island as YES, and the rebuild the copper area via “Rebuild Copper Area” button or “SHIFT+B”. 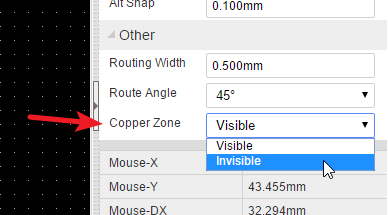 If you want to hide the copper area and keep routing tracks, you can set the copper zone invisible at the right-hand panel. 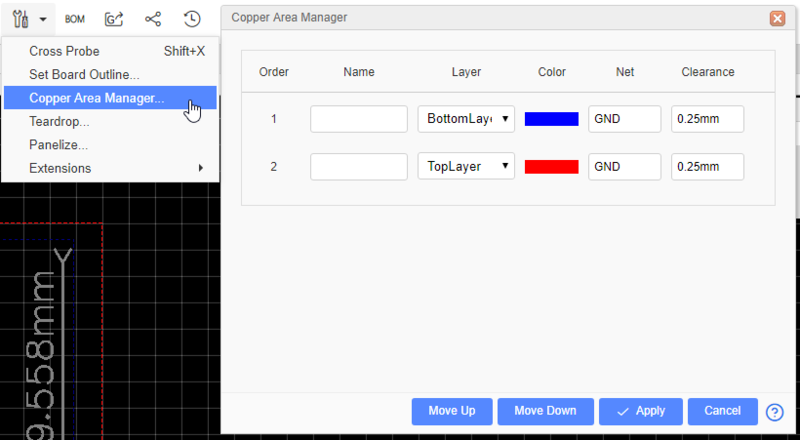 EasyEDA support copper area manager now, you can set the copper order and apply, the forward copper area will be poured first. The GND on the top and VCC on the top, you can see the clearance is different.